Click the photo to view a bigger version. 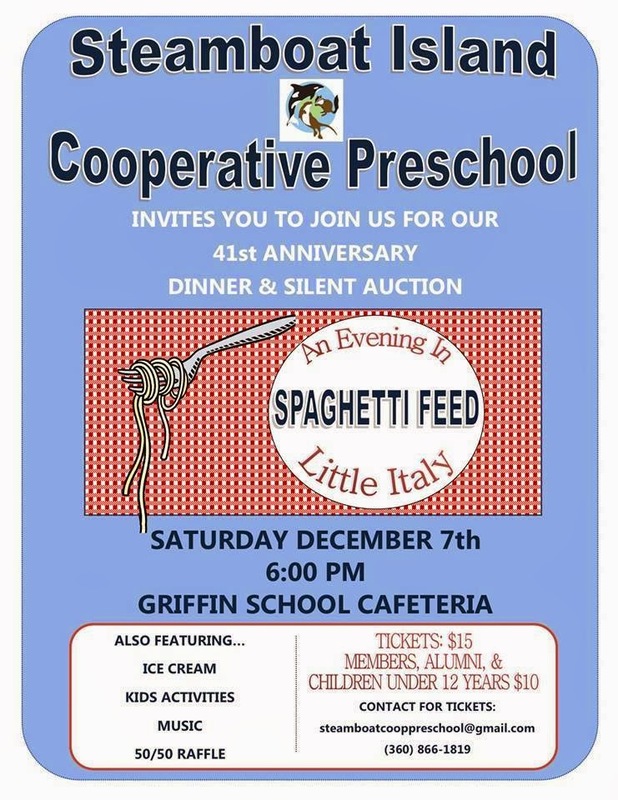 On Saturday, December 5, the Steamboat Island Cooperative Preschool will host its annual fundraising dinner at the Griffin School. This year the SICP has joined with Steamboat Grill & Greens to create a taco bar. Olympic Mountain Ice Cream will supply the dessert. There will also be a fun photo booth, arts and crafts for the kids, and a silent auction with many items donated from local businesses. Tickets are $15 and can be purchased by calling (360) 866-1819 or at the door the day of the event. Since 1972, the Steamboat Island Cooperative Preschool has provided an exceptional early learning experience for the children of our peninsula. 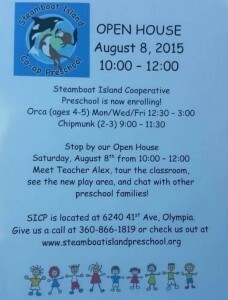 Click here for more information about the Steamboat Island Cooperative Preschool. 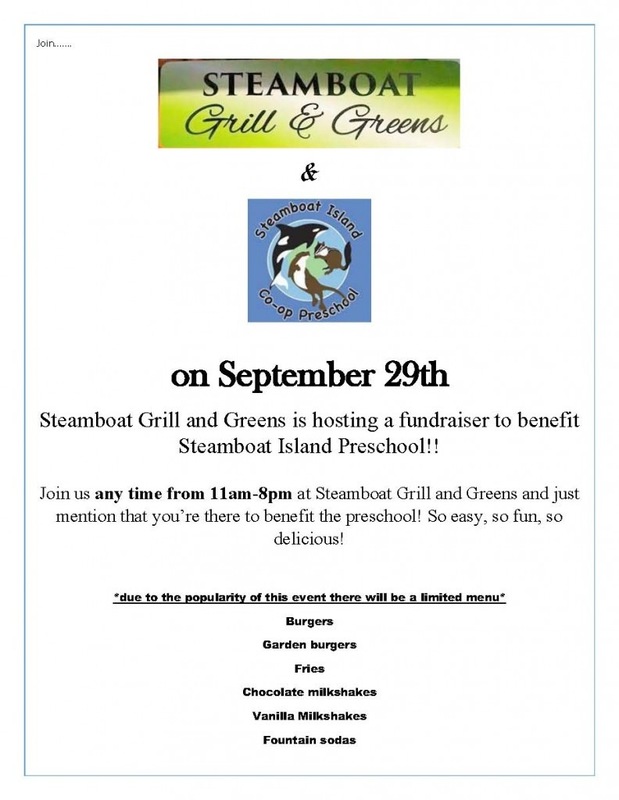 Steamboat Grill & Greens (formerly Steamboat Annie’s) is hosting a fundraiser to benefit the Steamboat Island Cooperative Preschool. For food purchases on Tuesday, September 29, Steamboat Grill & Greens will make a donation to the SICP. 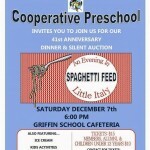 On Tuesday, just mention that you’re there to benefit the preschool. There will be a limited menu of burgers, veggie burgers, fries, shakes, and eggrolls. But if you’ve visited Steamboat Grill & Greens, you probably know even a limited menu is one of the best drive-in menus you’ll find. 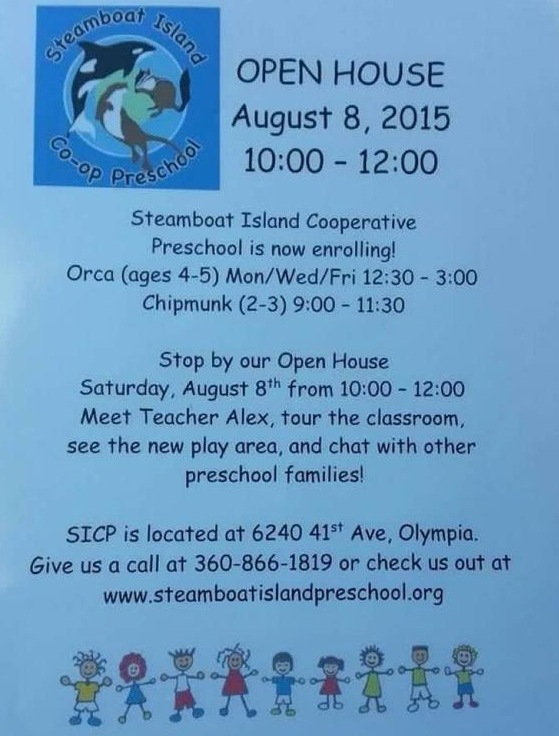 Are you familiar with the Steamboat Island Cooperative Preschool? Operating since 1972, SICP has offered an outstanding experience for children just starting their school years. It’s a school where past students are now enrolling their own kids! Three different classes provide programs for children ages 2 to 3 years (the Chipmunk class), 3 to 4 years (Otter class), and 4 to 5 years (Orca class). Led by a professional teacher, with parent involvement overseen through a program by the South Puget Sound Community College, SICP gives parents the opportunity to take part in their child’s early education. The Steamboat Island Cooperative Preschool is one of the local institutions that make living here on the Steamboat Peninsula so good. We welcome the chance to support the SICP in this way and thank Steamboat Grill & Greens for their donation. 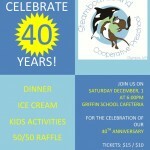 Featuring a 50/50 Raffle, Silent & Live Auction, Kids Music Feature, Photo Booth, Arts & Crafts, Face Painting, Ice Cream. Steamboat Island Cooperative Preschool is having an Open House for prospective parents for our Otter Class (ages 3-4 years old) on Saturday, August 9th from 10:00 AM until Noon. Stop by and meet our teacher, take a tour of the school, and talk to current members to learn more about SICP! 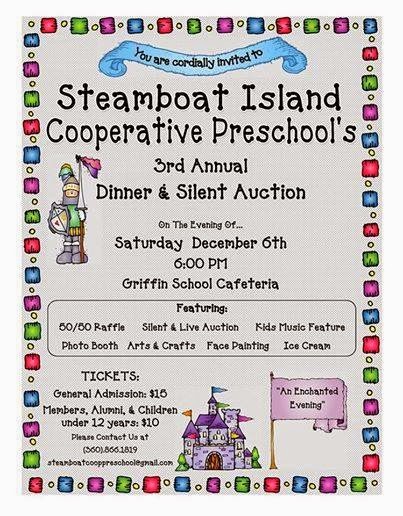 Click here to email the Steamboat Island Preschool, for tickets. Or purchase your tickets at the door. 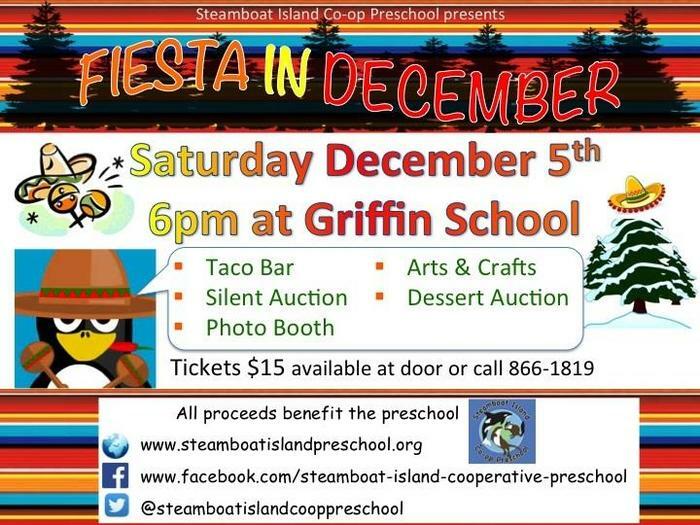 Are you an alumni of Steamboat Island Preschool? 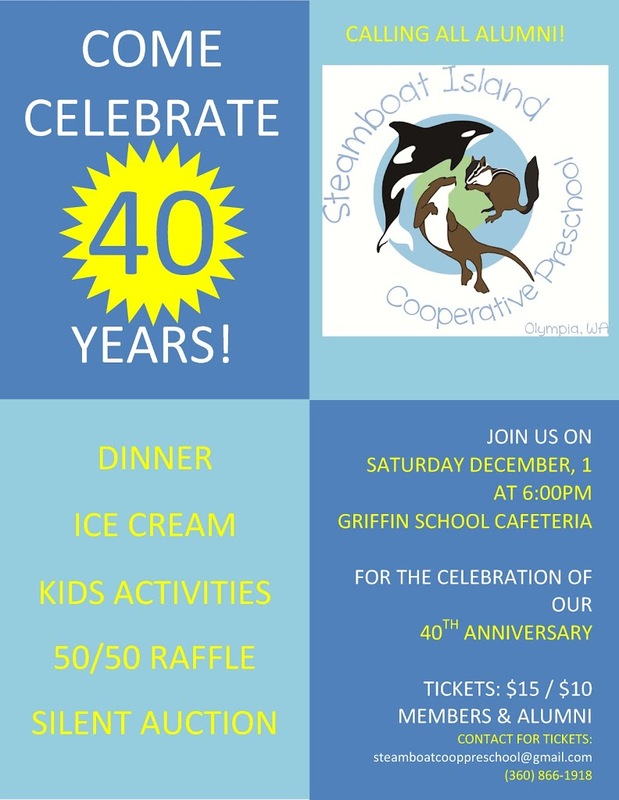 Please contact steamboatcooppreschool@gmail.com with your name and contact information. Come and see what we have in store for you this school year! Meet our new teacher, find your cubby, listen to a book in the new reading nook, play on the playground, and much more. This open house is for registered and interested families. We would love to see you there! 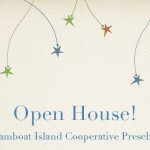 Steamboat Island Cooperative Preschool will hold its Open House Week May 14 through 18. Please call 866-1819 to schedule an appointment for Monday, Wednesday or Friday from 9:30-3:00. 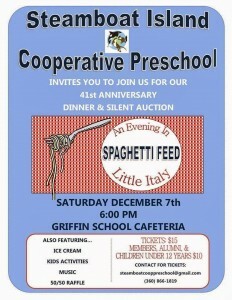 Bring your preschooler to check out the preschool and learn the benefits of this parent cooperative preschool. There will be activities to engage your child and knowledgeable people to answer your questions! Steamboat Island Cooperative Preschool is Now Enrolling for 2012/2013 school year! Serving 18 months -5 year olds. Since 1973 this non-profit school has provided a place where families come together to share in their children’s learning experience. Steamboat Island Cooperative Preschool is conveniently located at 6240 41st Ave NW, Olympia 98502. This is near the corner of Steamboat Island Road NW and 41st Avenue. Come for a fun family afternoon of golf challenges, kids games, a silent auction, and food! All ages welcome! Kids events will included balloon animals, face painting, games, and much more! Tickets are $10 each; includes admission & raffle ticket. For more information about the preschool or the Golf Carnival, call them at 866-1819 or visit them at www.steamboatpreschool.org, and Friend them on Facebook. Steamboat Island Cooperative Preschool is currently enrolling for their Orca and Otter classes. OPEN HOUSE: Monday, Wednesday and Friday during class the week of March 12. Come, bring your future Orca or Otter to join in the fun during class time. Please call ahead at (360) 866-1819 to reserve a spot. We will also have open house on Thursday evening, March 15 from 6:30-8pm. Steamboat Island Cooperative Preschool is a non-profit preschool located on the west side of Olympia. We serve families in both Thurston and Mason Counties. Email or call for a brochure.